Reading and share top 49 famous quotes and sayings about Alzheimer by famous authors and people. 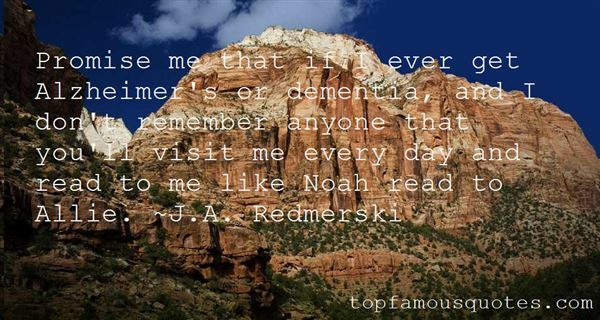 Browse top 49 famous quotes and sayings about Alzheimer by most favorite authors. 1. "It's from the newspapers that people I know - relatives and co-workers - have got the idea that crosswords are a prophylactic against Alzheimer's. Newspapers are of course also the place where crosswords (and now sudokus) are most readily available, so the association is presumably good for circulation." 2. "I am committed to helping Alzheimer's Society in any way I can. My family and I rely on the help of organisations like Alzheimer's Society to help us understand the disease and guide us in the care of my grandmother. It's been a privilege to meet so many people with dementia." 3. "In 1989, my father died after a prolonged struggle with Alzheimer's disease. All four of his siblings followed him into the shadow lands of that fascinating, maddening affliction." 4. "One of the great changes wrought by the increased public awareness of Alzheimer's - and thank you, Nancy Reagan, you wonderful tough old dame, you - is that people in the early stages of the disease are now speaking out while they still have the capacity to do so." 5. "As a writer, I have to admit, there is something darkly compelling about Alzheimer's because it attacks the two things most central to a writer's craft - language and memory, which together make up an individual's identity. Alzheimer's makes a new character out of a familiar person." 6. "New drugs and surgical techniques offer promise in the fight against cancer, Alzheimer's, tuberculosis, AIDS, and a host of other life-threatening diseases. Animal research has been, and continues to be, fundamental to advancements in medicine." 7. "Having greater self-esteem Looking better in jeans or a bathing suit Being able to participate in sports and other activities I used to enjoy Having a better relationship with my spouse Reversing diabetes, heart disease, or other health risks Decreasing my risk for Alzheimer's disease and other diseases of aging Having the confidence to apply for the job I really want"
8. "Alzheimer's is a disease for which there is no effective treatment whatsoever. To be clear, there is no pharmaceutical agent, no magic pill that a doctor can prescribe that will have any significant effect on the progressive downhill course of this disease." 9. "The medical literature tells us that the most effective ways to reduce the risk of heart disease, cancer, stroke, diabetes, Alzheimer's, and many more problems are through healthy diet and exercise. Our bodies have evolved to move, yet we now use the energy in oil instead of muscles to do our work." 10. "I lost my mother, who suffered from Alzheimer's disease, and we had to relocate my dad after 58 years in the family home. That was tough." 11. "If my dramatic career doesn't work out, I will go on to research and find cures for Alzheimer's or Parkinson's and other motor neuron diseases. It's a very exciting field of research. But I'd like to continue in drama, so it wouldn't be very smart of me if I blew this amazing opportunity with an inappropriate lifestyle." 12. "Dr. Cai Song is an internationally known researcher at the University of British Columbia and co-author of a recent textbook, Fundamentals of Psychoneuroimmunology. "I am convinced that Alzheimer's is an autoimmune disease," says Dr. Song. "It is probably triggered by chronic stress acting on an aging immune system." 13. "If out of concern over cloning, the U.S. Congress succeeds in criminalizing embryonic stem-cell research that might bring treatments for Alzheimer's disease or diabetes - and Dr. Fukuyama lent his name to a petition that supported such laws - there would be real victims: present and future sufferers of those diseases." 14. "I hang out with war vets in a hospital they will never leave alive.i was out in the garden with the alzheimers and asked them if god wears pnts, G my adopted father answered immediately,"No he wears a G'String. we all laughed so loud it brought the nurses running and then pretended to be discussing a stringed bridge over a river and all sat straight faced. an original thought God wears a G-String." 15. "In addition to relieving patient suffering, research is needed to help reduce the enormous economic and social burdens posed by chronic diseases such as osteoporosis, arthritis, diabetes, Parkinson's and Alzheimer's diseases, cancer, heart disease, and stroke." 16. "Promise me that if I ever get Alzheimer's or dementia, and I don't remember anyone that you'll visit me every day and read to me like Noah read to Allie." 17. "I play an 89-year-old man whose wife has Alzheimer's in a movie called 'Still.' I play a World War II veteran, I acted with my son and it's called 'Memorial Day.'" 18. "Somehow, knowing that Alzheimer's is coming mocks all one's aspirations - to tell stories, to think through certain issues as only a novel can do, to be recognised for one's accomplishments and hard work - in a way that old familiar death does not." 19. 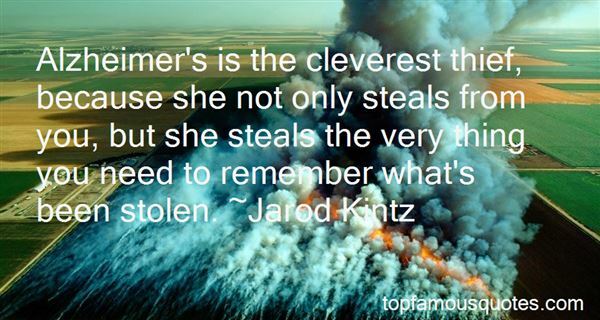 "Alzheimer's is the cleverest thief, because she not only steals from you, but she steals the very thing you need to remember what's been stolen." 20. "Suffering is always hard to quantify - especially when the pain is caused by as cruel a disease as Alzheimer's. Most illnesses attack the body; Alzheimer's destroys the mind - and in the process, annihilates the very self." 21. "Being on a sitcom stops me from getting Alzheimer's." 22. "In Wisconsin, We're at the forefront of research that might one day bring cures for diseases like Parkinsons and Alzheimers, and we must seize its great potential." 23. "If God gave Dad Alzheimer's, He's got to understand when Dad forgets what church he belongs to." 24. "Alzheimer's disease is never an 'accident' in a marriage. It falls under the purview of God's sovereignty. In the case of someone with Alzheimer's, this means God's unconditional and sacrificial love has an opportunity to be even more gloriously displayed in a life together." 25. "Dementia is often regarded as an embarrassing condition that should be hushed up and not spoken about. But I feel passionately that more needs to be done to raise awareness, which is why I became an ambassador for the Alzheimer's Society." 26. "Before my mother's diagnosis with Alzheimer's, I had heard of the disease, but hadn't known anyone who had suffered from it." 27. "You can't converse with Alzheimer's sufferers in the way you do with others; the dialogue tends to go round in circles." 28. "Caring for an Alzheimer's patient is a situation that can utterly consume the lives and well-being of the people giving care, just as the disorder consumes its victims." 29. "Alzheimer's caregivers are heroes." 30. "At some point [with Alzheimer's], there would simply be no point." 31. "Charlton Heston announced again today that he is suffering from Alzheimer's." 32. "I'm in awe of people out there who deal with Alzheimer's, because they have to deal with death 10 times over, year after year." 33. "Love is blind, there was no doubt about it. 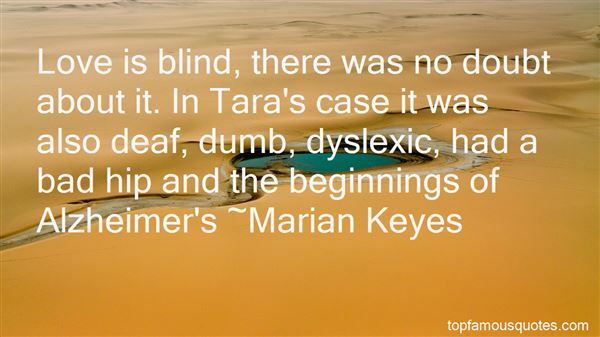 In Tara's case it was also deaf, dumb, dyslexic, had a bad hip and the beginnings of Alzheimer's"
34. "I read of a Buddhist teacher who developed Alzheimer's. He had retired from teaching because his memory was unreliable, but he made one exception for a reunion of his former students. When he walked onto the stage, he forgot everything, even where he was and why. However, he was a skilled Buddhist and he simply began sharing his feelings with the crowd. He said, "I am anxious. I feel stupid. I feel scared and dumb. I am worried that I am wasting everyone's time. I am fearful. I am embarrassing myself." After a few minutes of this, he remembered his talk and proceeded without apology. The students were deeply moved, not only by his wise teachings, but also by how he handled his failings.There is a Buddhist saying, "No resistance, no demons." 35. "You get the health benefits of coffee up through about the first twenty-four ounces. It's the biggest source of antioxidants for Americans, and we think it helps prevent Alzheimer's and Parkinson's as well." 36. "People do not realize that Alzheimer's is not old age. It is a progressive and fatal disease and staggering amounts of people develop Alzheimer's every day." 37. "Dedicated researchers seek better treatments and cures for diabetes, kidney disease, Alzheimer's and every form of cancer. But these scientists face an array of disincentives. We can do better." 38. "Alzheimer's... It is a barren disease, as empty and lifeless as a desert. It is a thief of hearts and souls and memories." 39. "Not all activities are equal in this regard. Those that involve genuine concentration—studying a musical instrument, playing board games, reading, and dancing—are associated with a lower risk for dementia. Dancing, which requires learning new moves, is both physically and mentally challenging and requires much concentration. Less intense activities, such as bowling, babysitting, and golfing, are not associated with a reduced incidence of Alzheimer's. (254)"
40. "I hate Alzheimer's. It is one of the most awful things because, here is a loved one, this is the woman or man that you have loved for 20, 30, 40 years, and suddenly, that person is gone. They're gone. They are gone." 41. "Competition got me off the farm and trained me to seek out challenges and to endure setbacks; and in combination with my faith, it sustains me now in my fight with Alzheimer's disease." 42. "What's bothering you? Did you read that paragraph in Sports Illustrated? The one about life expectancy for people with Alzheimer's? Yes. I read it. What did you think? Look, I think it's a guess, and a bad one. It's an average. [Crying] What upsets you the most? I want to see my son grow up." 43. "My father started growing very quiet as Alzheimer's started claiming more of him. The early stages of Alzheimer's are the hardest because that person is aware that they're losing awareness. And I think that that's why my father started growing more and more quiet." 44. "Laura Bush went on national television during the week of my father's funeral and spoke out against embryonic stem cell research, pointing out that where Alzheimer's is concerned, we don't have proof that stem-cell treatment would be effective." 45. "Alzheimer's, Parkinson's, brain and spinal cord disorders, diabetes, cancer, at least 58 diseases could potentially be cured through stem cell research, diseases that touch every family in America and in the world." 46. "It is leashed. Now drop the subject or I'll tell Sin you've seen me naked. (Kat)I will never bring this topic up again. Oh wait. What topic? I have Alzheimer's. I know nothing at all. (Kish)"
47. "You don't just wake up one day with dementia or Alzheimer's; these conditions are developmental. Even when a problem triggers the need to collect data, it's reviewed by a specialist and filed away. There's no central repository allowing information to be shared across a multitude of researchers worldwide." 48. "And there was this sweet-looking little old lady with her white hair in a bun and everything, the typical grandmother type, and she was swearing her head off. I guess Alzheimer's had brought out her inner sailor." 49. "Ronald Reagan's well documented final battles with Alzheimer's disease were fought with the same conviction and courage that his many public battles were fought." Quanto menos vida pessoal, mais segura e melhor será a vida intelectual."